You can change the organization and project role by navigating to your “Members” page. Make sure you have selected the correct organization on the top right corner of the page. You will see the “Role” column. Selecting a role from the Role drop-down allows you to change the user’s role at the organization level. Now to change the role on the project level click “edit” on the “Projects” column. Organization roles apply to every project in the organization. Project roles are what you want to edit if you want different permissions on different projects. Just click the edit button to change a user’s project roles. Project roles can also be changed from the “Projects” page. Simply click on “Projects” on the left menu, then click the project that you want to edit the user roles for. 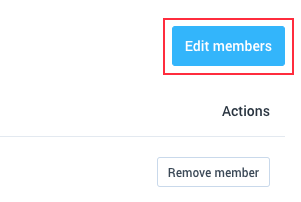 Next, click on the “Edit members” button to change the project roles. Next, you will see a dialogue where you should be able to assign/re-assign members to the project and change their roles. 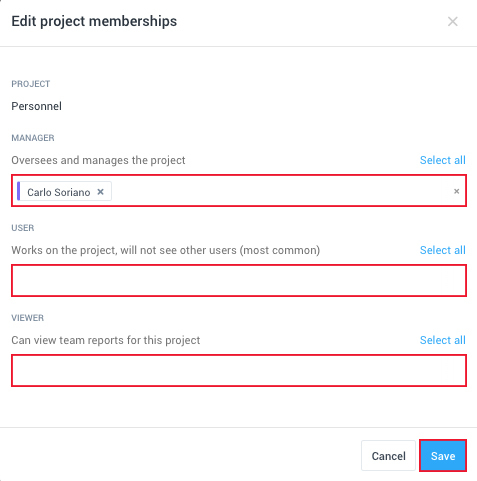 You are allowed to type the member’s name in the text boxes, select/deselect all, click the “x” next to a member to remove project membership and even drag & drop the members across the different roles. Here’s what the “Edit Project Memberships” dialogue looks like. You can set managers on the project, users on the project, and viewers on the project. For more information about user permissions, please click here.